Q. Tell us about yourself briefly and about your work. I worked in the areas of research and development of materials at Japanese companies, tech-nology research in Europe, and establishment and management of the research institution for medical-device related products in Switzerland for 25 years in total. I left the company in 2015 and founded a company which provides therapeutic service based on the Reset Therapy in January 2016. Q. What led you to the “Reset Therapy”? I stumbled upon the Reset Therapy when I was suffering from dysautonomia and stiff shoulders due to my stressful hard work. The symptoms are so severe that I had to take sick leave. None of the treatments brought dramatic improvement to the symptoms until I tried the Reset Therapy as my last hope. After several treatments, I became so much better that I could return to work. Q. What is the reason that you started the therapy in Switzerland? I understand that the basic concept of the Reset Therapy is an innovation of Japanese therapy as hand manipulation. 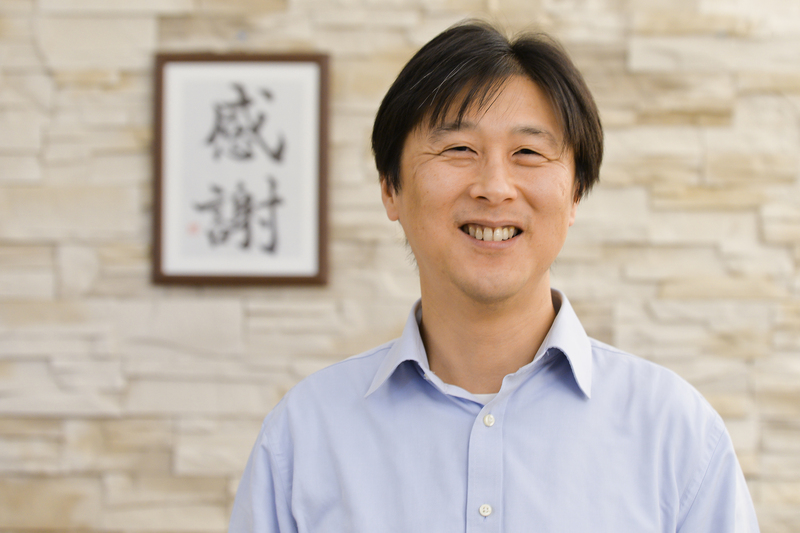 I opened a Japanese Reset Therapy clinic thinking that it has to be me to start to expand it overseas, especially in a satisfactory environment such as Switzerland, as I have a deep understanding of the Reset Therapy and the experiences of accomplishing many missions overseas. Q. What are the characteristics? The Reset Therapy is to mitigate the tension of the muscles which have chronically become hard without pushing nor massaging strongly. When they are aggressively stimulated, the brain reacts in a protective fashion to it and the muscles become even harder afterwards. We can ease the muscle tension by touching the muscles while paying attention to respiration gently swaying and stretching. When the muscles are reset, the circulation of blood and lymph improve, the pain is relieved, and the body alignment and posture become corrected. The body will finally be able to restore the balance by its natural healing ability, leading to the improvement of the whole body. Q. For whom do you recommend this therapy? I recommend this therapy for those with symptoms such as stiff shoulders, back and neck pains, headaches, knee pains, numbness, coldness, chronic fatigue, insomnia, dysautonomia, snoring, stuffy nose and so on as well as for those who feel down, who want to keep up the maintenance of the body, who want to prevent illness or injury, and who expect esthetic improvements from the synergetic effect. The treatments are especially suitable for those who tend to work too hard juggling work and raising children, who spend the day sitting in the same posture for long hours, or whose me-tabolism is decreasing year by year which makes it more difficult to get rid of fatigue. Q. After how many treatments can one usually feel the change? Many people who particularly have been feeling unwell for a long time and have not fundamen-tally improved after having tried various methods feel the change even after the first treatment. As a therapist, I strive to make my clients be able to feel the change by the third treatment in order to keep their motivation to continue the treatments. Q How often should one receive the treatments for the best results? I generally advise my clients to receive treatments once a week for the first 5 to 6 times, and afterwards once in 2-4 weeks depending on the progress of muscular relaxation. I give them advice how to keep the muscles relaxed. Q. What kind of advice is it? I tell them which parts of their muscles are tense, and give them advice about posture and how to sit. By measuring the changes in body temperature and posture before and after a treatment, I can show them the differences visually. Q. What are the important things as a therapist ? It is to be able to face clients in a relaxed mind with energy and to be able to observe them in detail. If I can recognize even a slightest change in their condition, it makes it possible for me to reflect it in the approach of the future treatments. In addition, I make sure that I understand the tension pattern of the muscles of the whole body, the distortion of the skeleton and the charac-teristics of the body in the early stage of the treatments. Q. Do you have anything you want the clients to feel? I would like them to be conscious of the improvements on their body. I believe that it is better to receive treatments in a relaxed condition while they are controlling own breathing. The range of movements of the joint becomes greater as the muscles get relaxed, and it makes it easier for them to feel even a slight change which leads to the motivation for them to continue improve-ment. Q. Is there any feedback you hear often? I hear pain relief, feeling a burst of energy due to ease of muscle tension, lighter body, and de-veloping a positive mindset. Q. What is the biggest challenge that you have faced so far? Also, how did you overcome that? It is the authorization of my business and the renewal of my residency permit. I needed to con-firm if I could operate a clinic with a new concept of therapeutic service, and it was unclear whether I would be approved as self-employed. I was concerned because it was just after Swit-zerland introduced more restrictive immigration measures. I created my business plan and carefully explained it to the labor department of the canton (Service de l’emploi). If either had gotten re-jected, my business would not have come true. Q. Do you have any belief, motto or philosophy? Q. Do you have any future vision or new plans? I believe that there is a strong need for this therapeutic service, and I am planning on training therapists and eventually opening a second clinic. Although the purpose of receiving the treatments for clients is improvements of their body, as a therapist, I give advice thinking that after their health condition improves, they are going to take a new step to reach their expectations, hopes and dreams that they had to refrain from due to their physical problems come true. I believe that enjoying the process of challenging what you actually want to do and the possibili-ties is the ultimate joy of one’s life. Mr. Shigematsu, thank you very much for your cooperation for this article. All of the staff mem-bers at SwissJoho.com wish you all the best for your continued success. The original Japanese article is below.